There are generally copious amounts of chocolate in our pantry. I keep on contriving new places to sneak more into the house away from the kids’ (or my husband’s) prying eyes. Usually this is a challenge, but when we approach Easter (or even Christmas for that matter), my task seems to become nigh on impossible! However, I am a stubborn woman and where there’s a will there is a way! In our house, chocolate falls into several categories; general eating chocolate, chocolate for a particular purpose (such as a cake or bake) and Kat’s chocolate. Over the years, Simon has learnt, that he is better not to waste his breath asking me to share my chocolate as it will end in an argument. The safer course is for him to wait for me to offer him some. I am very good at offering him the dark chocolate, which he doesn’t like so I get to keep, but not so accomplished at sharing the chocolate that he would actually enjoy! Easter baking wouldn’t be complete if it didn’t involve Mini Eggs. They are totally addictive and would be welcome all year round! 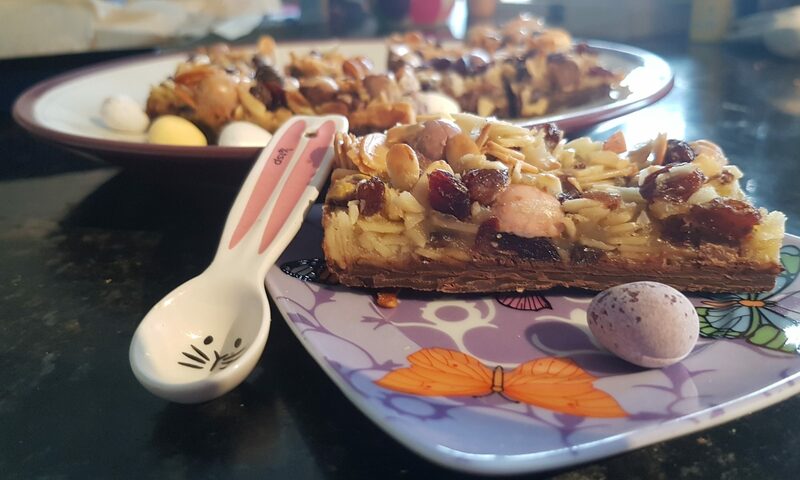 This year, I decided to put Mini Eggs into my mum’s favourite biscuit – the Florentine. 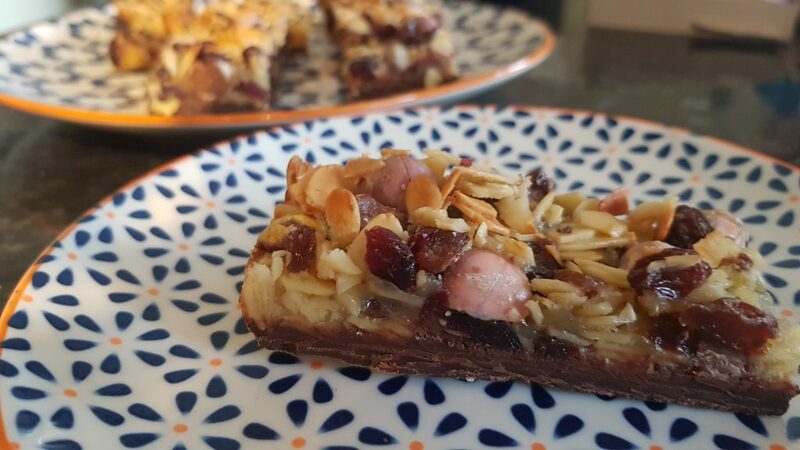 These Florentines are not at all authentic, but that doesn’t stop them from being remarkably moreish. We melted the base chocolate and allowed it to set in the bottom of the pan before cooking so it didn’t take quite so much time to make. Please please please though, if you are baking with Mini Eggs and small children do not ignore the step to crush them or chop them up. Grease and line a brownie tin with baking parchment. Break up the chocolate and put in a heatproof bowl and place over a simmering pan of water to melt. Once melted (the bowl will be hot), adult pour it into the lined brownie tin and ask your little chef to tilt the tin so that the chocolate covers the entire base. Put in the fridge to set. Put the mini eggs into a ziploc bag and bash with a rolling pin until they are all crushed. Crack the eggs into a small bowl or mug and whisk. 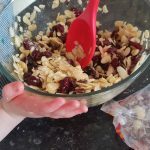 Put the dried fruit and almonds in a large bowl and mix. Add the sugar, melted butter and beaten eggs and mix until fully combined. Add the crushed mini eggs and mix again. Remove the brownie tin from the fridge and put the egg mixture on top of the chocolate and gently spread to completely cover it. 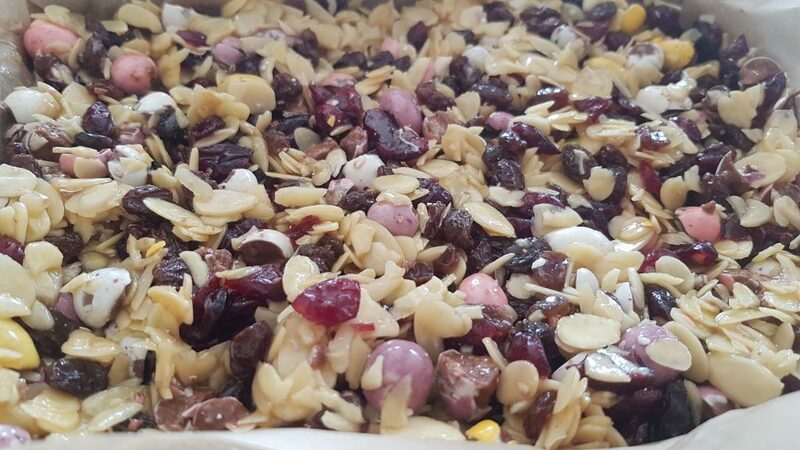 Leave to cool completely in the tin and once fully cooled cut into fingers or squares and store in the fridge. We left ours to refrigerate overnight before slicing to ensure they were completely cool and sliced with a knife heated in boiling water. Unfortunately we are not seeing my mum until just before Easter and it is highly unlikely there will be any left by then! Sorry mum! I peer at them every time I open the fridge, just to check they are still there (and inhale their gorgeous scent) and to ensure no bandits children have come to treat-nap them! I should also add, the kiddies had small squares. I did have a large slice or three after giving blood, but I considered that that was well deserved! They look yummy. 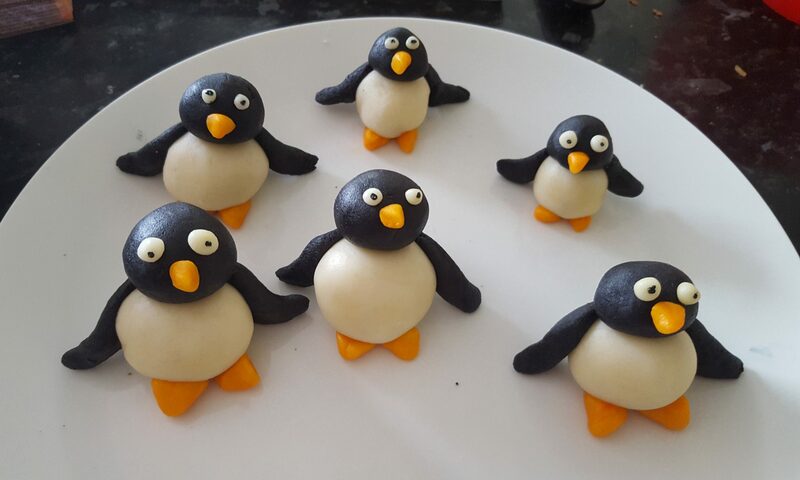 I bet that the kids enjoyed making them…. but more importantly eating them! They are a distant memory now and I am wishing we still had some left! 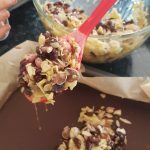 This is my story about some of the activities I do with my kids … and my baking.